Once the first snows begin to blow you will want to have a dependable tool to help clear your walkway and drive for safety purposes. Depending on where you live and your annual snowfall, you may need to consider something that can handle large amounts at a time. You may also want to consider a tool to keep walkup decks, patios, and other small areas clear of drifts. Snowblowers are powerful tools and are often a go-to for areas that receive significant snowfall each season. A Snow Brush, on the other hand, is designed to clear out snow that isn’t as densely packed, plus it has multi-seasonal uses. 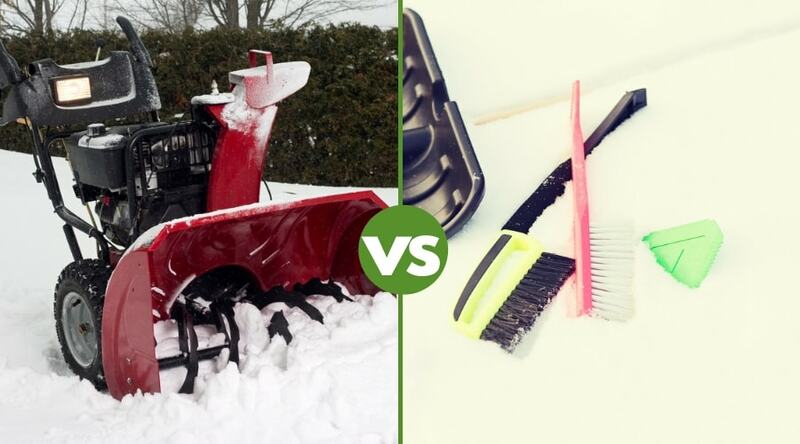 The differences between a snow brush vs a snowblower are detailed below to help you decide which is the best tool for you. 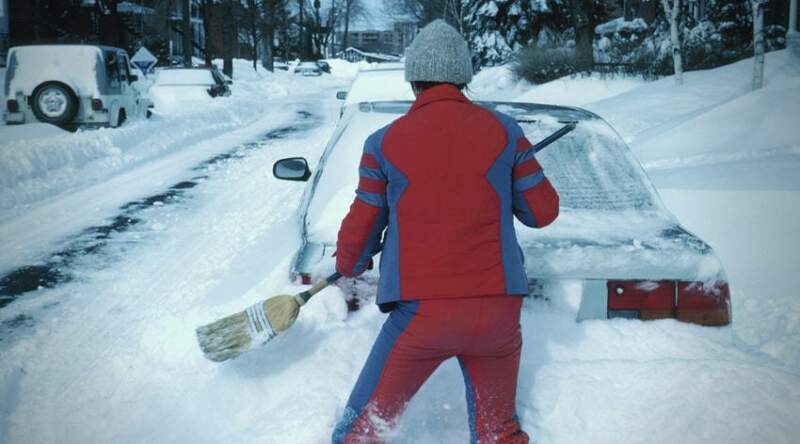 A snow brush, otherwise popularly known as a power brush, power sweeper, or power broom, is not the small, handheld tool used to clear your vehicle windows from accumulated snow (although they go by the same name). 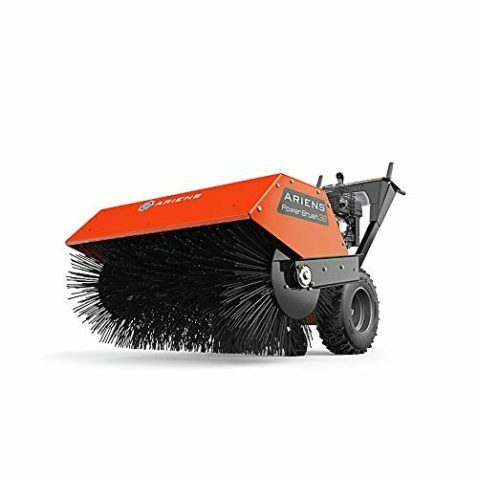 This tool is a gas-powered machine that you walk behind to help clear snowfall with the use of durable wire and plastic bristles. They come in a variety of different model sizes and can be useful in areas of light to moderate snowfalls. 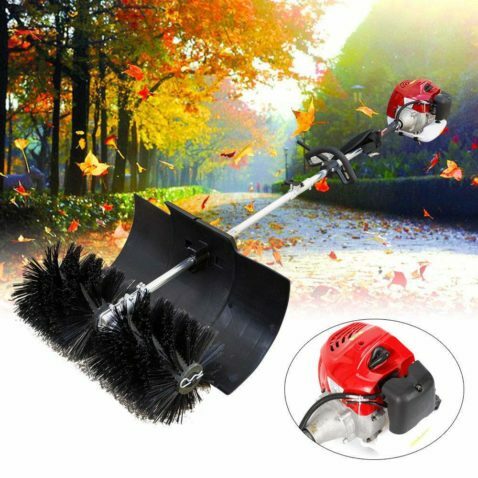 Plus, they are widely popular due to how well they can be used in various seasons to help clear your walking and parking areas of leaves, sand, dirt, and snow. A snow brush basically comes in two different styles to meet various needs. One is a more compact design for handheld use, is highly portable, and works well for those hard to reach areas. 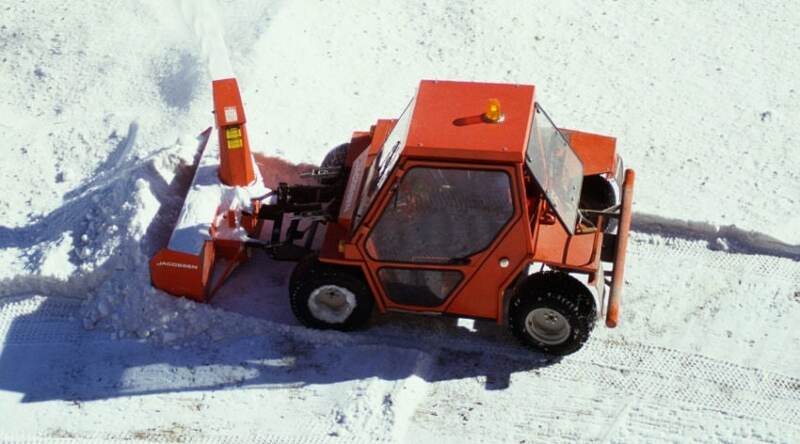 The other is made for clearing large areas of snowfall and is powered by a strong motor as a push behind the design. 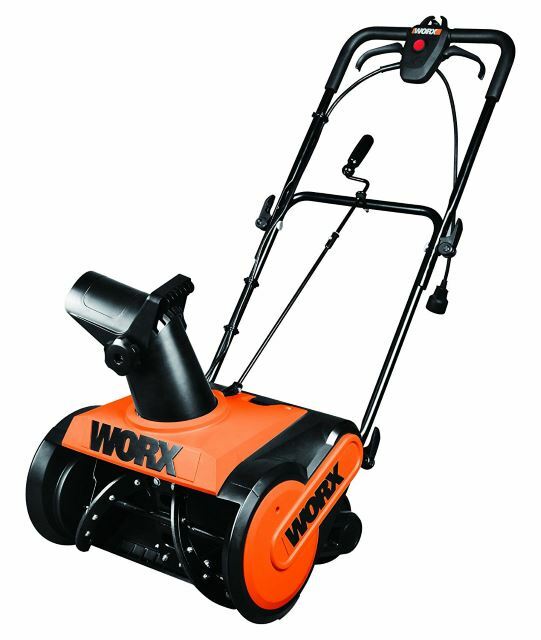 2-cycle (or 2-stroke) engines are highly popular for powering tools for property maintenance. These simple engines are run with a gas and oil mixture to lubricate the engine and provide the combustion needed to run. The long handled design which powers spinning nylon, or metal brush end, are excellent for handheld use- and allow you the opportunity to get into hard to reach areas, and clear dirt, debris, and snow from the crack and crevices of your walkways and drives. These are especially handy for brick walkways to help keep your designs and patterns looking clean and clear. A 4 stroke engine provides the capability to power a larger, stronger, more durable machine. The walk behind models measure their brush width in feet and are designed to clear larger areas of debris and light to moderate snow packs. These have either a pull start or electric start that requires you to plug them in overnight for a charge. A power brush is not at all limited to winter months and is a very helpful tool for year-round clearing of debris from your landscape surfaces. Porches, decks, drives, walkways, and patios can all be cleaned up with the use of this tool. This also helps justify the overall cost in that it is not a machine that will sit in storage for the majority of the year. Snow brushes are most efficient in light to moderate snowfalls and may struggle to clear packed snow and ice. The quick rotation and durable brushes are very effective in quickly ‘brushing’ snow forward and away from the machine as you move forward, but it is not build to dig or chip away at materials. Handheld design is also very popular for clearing small areas of snow. 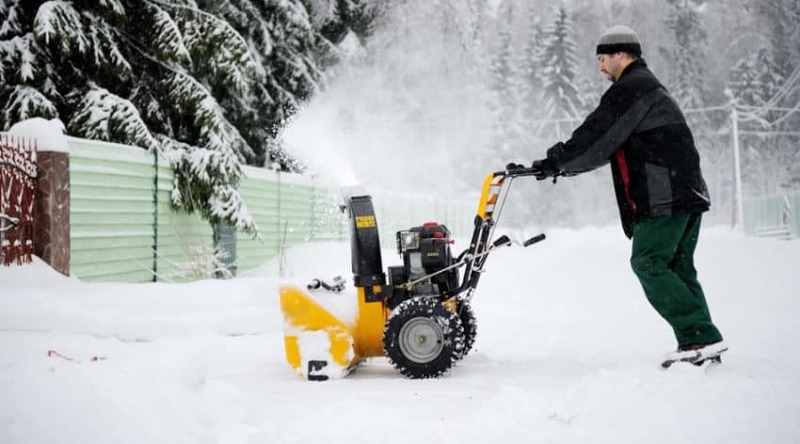 This can be especially helpful when clearing up spaces that have been gone over once already with a snowblower, as certain models do not clear all the way down to the surface of whatever you are attempting to clear. Plus, they are easy to use, making them a good choice for anyone who needs a low impact design. Like any tool, however, there are some drawbacks to consider. For starters, a snow brush is best used for lighter snow. Heavy snowfalls and deep snow are not going to be moved very easily. Long, wide driveways may also not be the best choice as snow can also become packed onto the bristles as you work, creating a less effective sweeping motion and make you work longer to get the area clear. 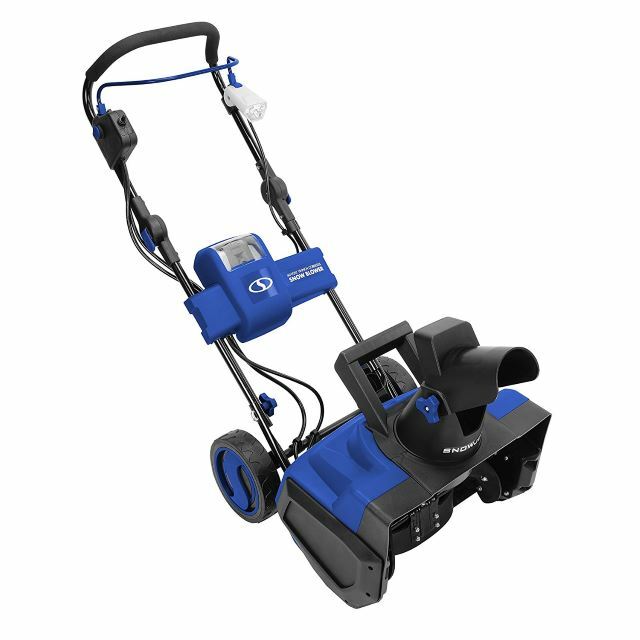 Powered by either gas or electricity, snowblowers come in a wide variety of choices- including both corded and cordless versions. These are powerful workhorses built with 1, 2 or even 3 auger systems to pick up, clear, and toss snow far away from your work area. These augers are also capable of chomping through packed, deep snow and ice. There also even large tractor and ATV adapter options to create seriously powerful snow-moving machines for large, long driveways. Snowblowers are also good choices to use over gravel driveways as well depending on the model- making them a choice that provides variety for your property needs. 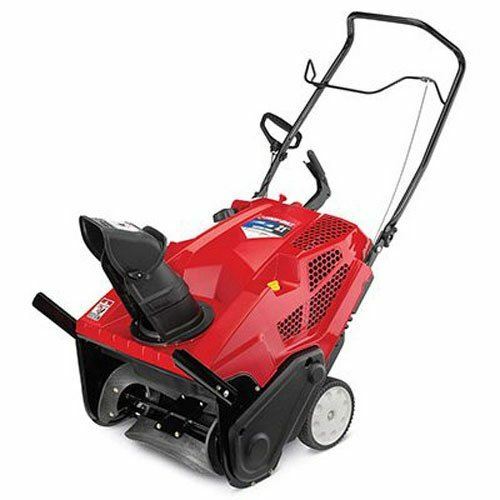 As mentioned, there truly are many different versions and sizes of snowblowers. This is especially useful in that you can pick from this variety in order to choose exactly what you need. For example, a professional 2 stage model is not what you need for a small driveway and walk, but a single stage design maybe not enough if the driveway is gravel. In this situation, you might want a smaller 2 stage model to provide gravel clearance but also provide a more compact design. These machines are typically a single stage design and connect directly to your wall outlet. The drawback is you are limited by the cord length- which makes them ideal for smaller areas. These are easy to grab and go with and require very little maintenance or prepping prior to use, plus they come in some seriously compact designs for the patio, deck, and walkway clearing. Defined by both single and 2 stage model designs, cordless electric models have been making strides in the industry in reference to power and size. These designs are powered by rechargeable lithium-ion batteries, are easy to use, require little maintenance, and are generally best used for small to moderate size areas (although some larger models exist). These machines are defined by a 4-stroke engine and single, 2, or 3 stage designs which reference the number of augers used for snow moving power. These offer, by far, the largest selection of choices, and require simple 4-stroke engine maintenance and are considered very dependable and powerful to handle anything winter throws at you. 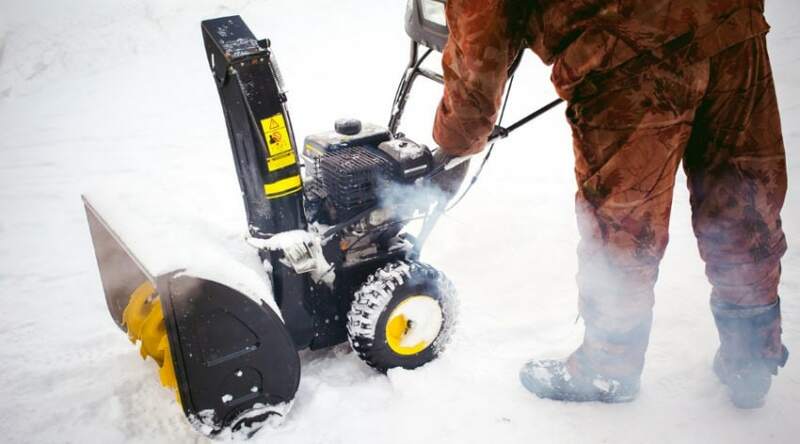 Snowblowers are designed specifically to clear snowfall from a wide variety of surfaces, including driveways, walkways, and other areas that need access. Smaller models often clear snow right down to pavement for a clean look, but may not be best for gravel or uneven surfaces. Larger models provide adjustable clearance but may leave a thin skin of snow to accommodate uneven ground. Either way- you are able to walk behind the machine with very little exertion to quickly and efficiently clear your area. These machines are incredibly efficient and clear snow well away from the area you are working in. This is especially helpful for climates that receive large amounts of snowfall as clearing your spaces to become a regular occurrence. Plus getting snow thrown far from your work area is important to avoid large buildups as the season progresses. These machines are even able to tackle heavier, wet snow, as well as packed snow and ice- such as the mess the snow plow often leaves behind at the end of your driveway. 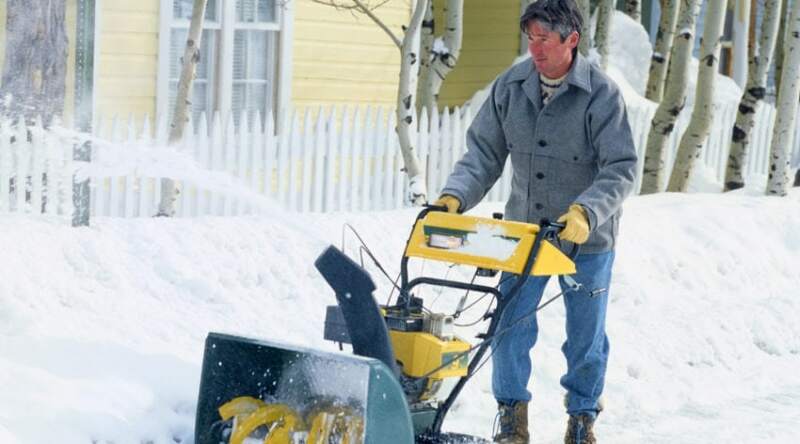 Just make sure to keep your machine maintained and properly oil and gassed up (or charged) so you aren’t delayed in getting your area free from snow. 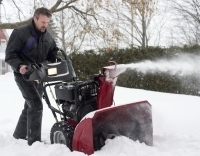 Snowblowers are specific to winter use and aren’t any help when the snow isn’t flying. They also can be large and bulky to store, plus you do need to drain out fluids and get them ready for the warmer months so they don’t have any problems when you are ready to use them again. Snowblowers have also been known to throw any rocks or other hard debris left behind which can be problematic if you do not have the chute pointed away from vehicles and windows. Where you live and the amount of snow you expect should drive your decision on which of these machines are best for you. Snow Brushes are excellent for getting a clean surface year round but don’t handle large, heavy accumulations well. They also may not be the most efficient choice if you need to regularly clear large surface areas. Snowblowers come in an incredible array of choices to fit the needs of climate, clearance space, and personal power preference. These are built to move snow but have no use through the rest of the year. Maintenance is required but is fairly easy and minimal, but you do have to store them when not in use and many can take up quite a bit of room. If you have any questions or comment, please let us know below. And, as always, please share!